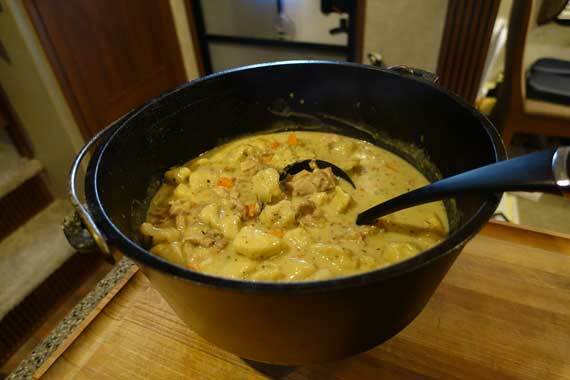 Most people think that chicken and dumplings are difficult or time consuming to make. They can be, but they’re not if you use cheap canned biscuits instead of making your dumplings from scratch, and believe it or not, they’re awesome. Believe me, you wont be able to make enough of this stuff. I made this on a Sunday, and ended up making more on Wednesday after multiple requests. 3 lbs chicken thighs (boneless and skinless) cubed (I used thighs, because breasts can end up really chalky tasting if they’re boiled). 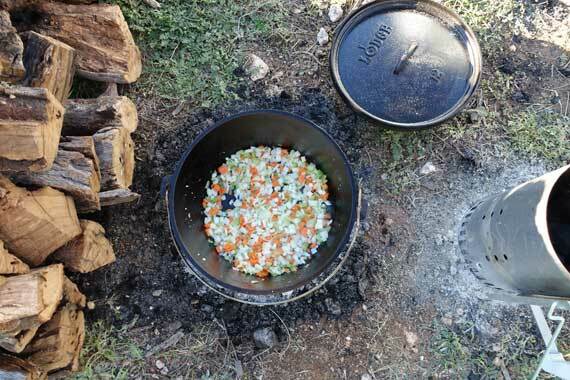 As always, if you’re making this on a camping trip, it’s a lot easier if you prep at home, throw everything in Ziploc bags and take it with you. Cut chicken thighs into 1/2″ cubes, put in large Ziploc and freeze. Finely dice the celery, carrots and onion. Throw into large Ziploc and freeze. Throw the salt, pepper and thyme into a single Ziploc. Before you get started, make sure you’ve taken out your ingredients and given them time to thaw. 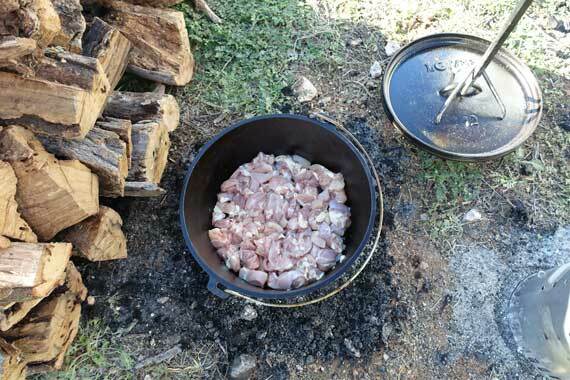 Set up your dutch oven for frying. Twelve charcoal briquettes underneath (if you’re using charcoal) should do the trick. Put your vegetable oil in the dutch oven and let it heat until it shimmers or a drop of water sizzles and pops when you drop it in. Toss in your cubed chicken thighs and brown on all sides. Once browned, take out and set aside (it doesn’t need to be fully cooked). Make sure you also take out all the liquid with it. 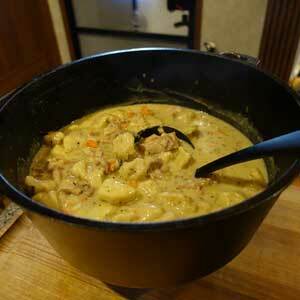 Melt your butter in the bottom of your dutch oven, then throw in your onion, celery and carrot mix. Cook until the carrots start to become translucent and the veggies start to become soft. About 5 minutes. Add your chicken back in along with the drippings, your chicken broth, thyme, salt and pepper and simmer uncovered for 20 minutes. 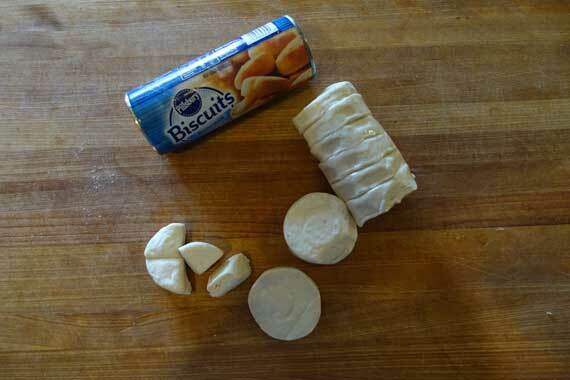 While that’s simmering, open up your canned biscuits and cut them into quarters. Once you’ve let it simmer for 20 minutes, add the milk, quartered biscuits and cream of chicken. Cover and simmer for another 30 minutes. About ten minutes through this simmer, take the lid off your dutch oven. Your dumplings will be floating on top and likely stuck together. Break them up and stir them back in with your wooden spoon. Be sure to cover your dutch oven back up. 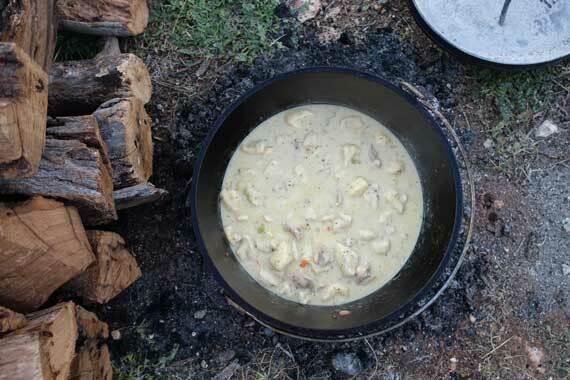 I like to serve my chicken and dumplings up in large coffee mugs so it’s easy to hold while hanging around the campfire. I and my assistants made this for out Camp Chief Little Turtle’s 2017 Spring Cub Scout Camporee. Multipled it by 5 (for 30) and cooked it on the camp stove. 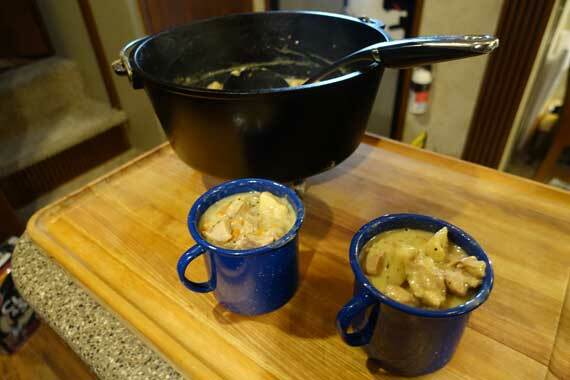 Due to time constraints I prepped it onsite with partially frozen chicken thighs (made cubing it a chilly breeze). Used a mandolin slicer for delicately sliced veggies. Otherwise, I followed the directions as written. We, Pack 3199, won the traveling Golden Spoon award (in competition with 26 other Cub Scout packs) for this dinner recipe – along with cooler cooked corn on the cob. That’s awesome! I think we use this recipe more than any other on our site. Haha, awesome! 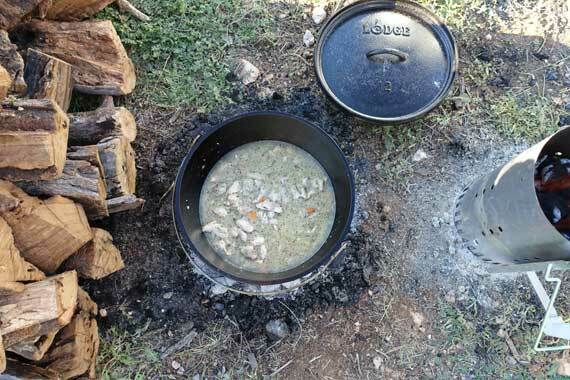 Jealous of your 14″ dutch oven. I need one. That’ll be a lot of fun. Amazing recipe. .everybody loves it… you have a great site.. thank you.